Short, rotating pulses of light reveal a great deal about the inner structure of materials. 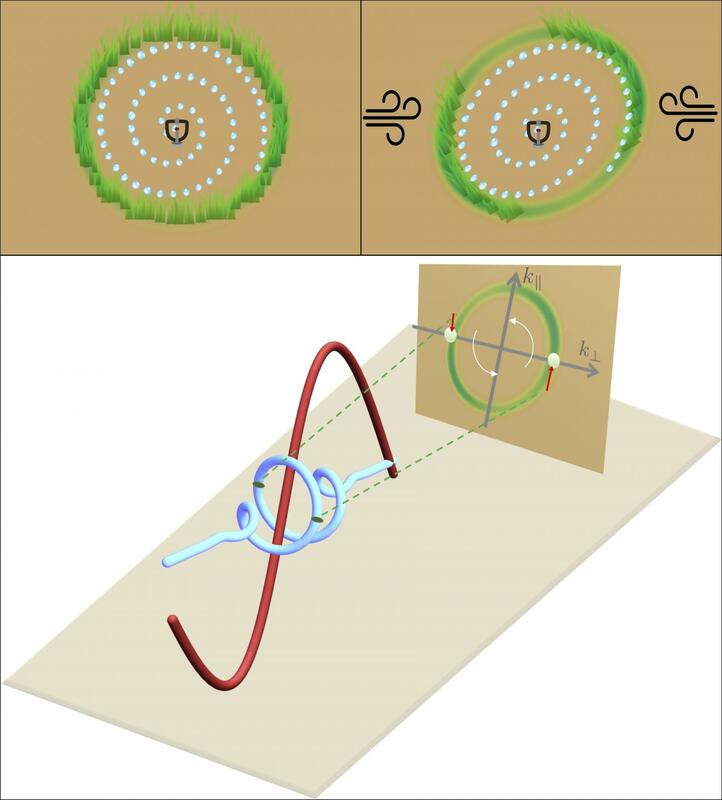 An international team of physicists led by Prof. Misha Ivanov of the Max Born Institute for Nonlinear Optics and Short Pulse Spectroscopy (MBI) has now developed a new method for precisely characterising such extremely short light pulses. The research results have been published in Nature Communications. Not all light is equal: depending on how it is prepared, it can exist in very different forms. Not only can we choose different wavelengths or colours but, as an electromagnetic wave, light can also exhibit different forms of oscillation. It can occur in different polarisations, for example – either linearly polarised or circularly polarised, where the oscillations of the electromagnetic fields follow a line or go round in circles, respectively. Above all, extremely short pulses of polarised light waves are excellent for studying many different types of materials. We have methods for producing such pulses, but these methods are already pushing the limits of technical feasibility and the light pulses are not always produced with the desired properties. A new method now allows us to characterise these short light pulses with unprecedented precision. The trouble starts with the fact that the processes of interest taking place inside matter, which we would like to study with our light pulses, are extremely short-lived. Accordingly, the light pulses have to be similarly short, in the range of around 100 attoseconds (billionths of a billionth of a second). In this unimaginably short timespan, a light wave can only undergo a few rotations. Even using the latest laser methods to produce such ultrashort pulses, it can easily happen that the light wave will not come out rotating the right way. The concept for the new method can be described as follows: one fires an extremely short, high-energy and circularly polarised light pulse at an atom or a solid body where, upon being absorbed, the light pulse knocks an electron out of the body. This electron then carries information about the light wave itself and can furthermore reveal clues as to the properties of the sample being examined. Because the light pulses are circularly polarised, the ejected electrons also fly off with a rotating motion. "You can compare the electrons being ejected with a one-armed sprinkler, which either continues turning in the direction you want it to, or which keeps stuttering and even changing its direction," says Misha Ivanov, Head of the Theory Department of the Max Born Institute. If the sprinkler is allowed to run for a while, then it will wet the grass in a full circle – irrespective of whether it rotates consistently or not. So, merely looking at the grass will not reveal whether the sprinkler has been turning exactly the way it was desired or not. "But if a gusty wind comes along, then we can distinguish whether the sprinkler has been turning regularly or irregularly," Ivanov says. If the wind blows alternately from the left or right each time the arm of the sprinkler faces left or right, then the patch of wet grass will not be circular, but rather elliptical in shape. A sprinkler rotating completely irregularly would magically conjure up an ellipse on the grass stretched in the wind direction, while a regularly rotating sprinkler will display a tilted ellipse. This "wind" is added into the experiment in the form of an infrared laser pulse whose oscillations are perfectly synchronised with the ultrashort pulses. The infrared radiation accelerates the electron either to the left or right – just like the wind blows the water droplets. "By measuring the electrons, we can then determine whether the light pulse possessed the desired consistent rotation or not," says the first author of the publication in Nature Communications, researcher Álvaro Jiménez-Galán of the Max Born Institute. "Our method allows one to characterise the properties of the ultrashort light pulses with unprecedented precision," Jiménez-Galán adds. And the more precisely these light pulses are characterised, the more detailed information can be derived about the electron's place of origin within an exotic material. This is of special significance when it comes to studying a whole series of novel materials. These could include superconductors, which can conduct electricity without electrical resistance, or topological materials that exhibit exotic behaviour, the research of which earned a Nobel Prize in Physics in 2016. Materials like these could be used to make a quantum computer, for example, or could allow superfast, energy-efficient processors and memory chips to be built into normal computers and smartphones. The new sprinkler method still only exists in theory for the moment, but ought to be implementable in the near future. "Our requirements are fully within the latest state of the art, so there is nothing to preclude this from being realised soon," Ivanov asserts.